Posts tagged with "iPad Diaries"
In the first part of my ongoing experiment with controlling and accessing a Mac from the iPad Pro, I covered FileExplorer – the app I use to open Finder locations from iOS' Files app – and shared a collection of shortcuts to control certain macOS features via Siri and the Shortcuts app. 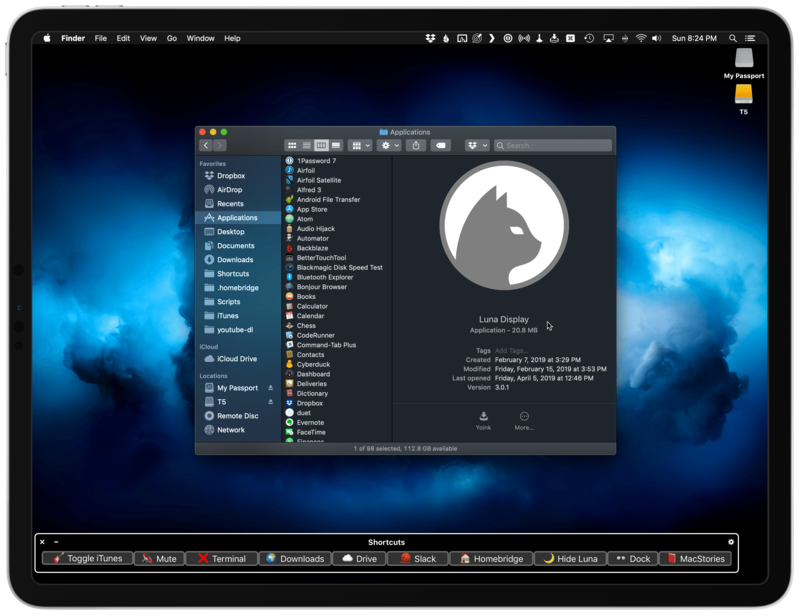 I also described my podcasting setup and how I've been taking advantage of Keyboard Maestro to automate window resizing across my two displays connected to the Mac mini. Today, I'm going to cover one of those two external displays – the iPad Pro running the Luna Display app – and how I've been using it to have "macOS as an app" on my iPad Pro. If you find this idea of reducing macOS to an app that runs on the iPad upsetting, the rest of this article likely isn't going to make you happy. If you're intrigued, however, strap in because I have a lot to share. I have a love/hate relationship with Apple's Smart Keyboard for the iPad Pro. On one hand, I've always been a fan of its small footprint and ability to almost become part of the device itself from both a hardware and software perspective. 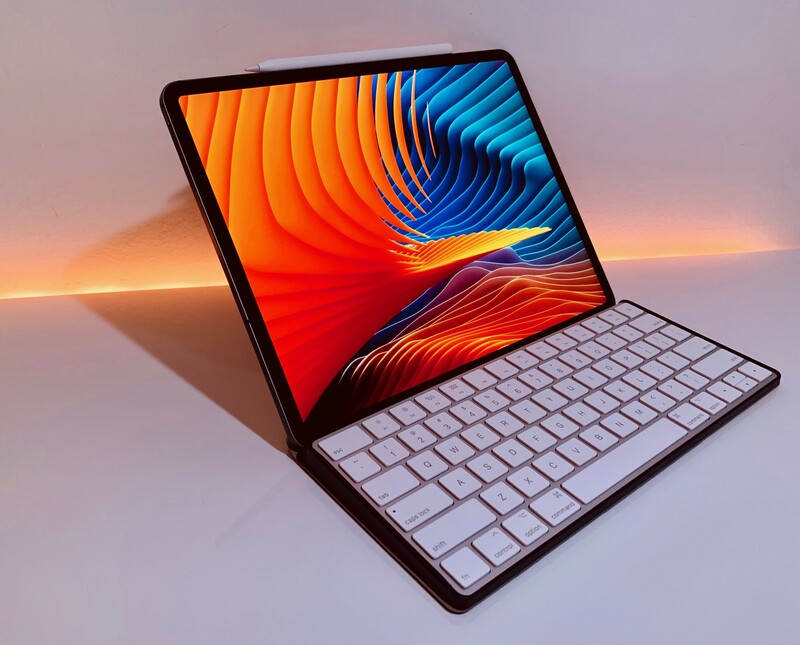 The Smart Keyboard snaps itself into place and attaches magnetically to the iPad Pro; it doesn't require you to even think about charging it as the Smart Connector takes care of it; thanks to the trivial magic of magnets, the keyboard and cover stay attached to the iPad as you carry it in a bag, but can be easily disconnected at a moment's notice should you need just the iPad's screen. The software experience is equally intuitive and exquisitely Ive-esque: the Smart Keyboard requires no pairing because it eschews Bluetooth altogether, and it integrates with all the keyboard shortcuts supported by iOS and apps. In the latest iPad Pro, the Smart Keyboard is even Face ID-aware: you can double-tap the space bar to authenticate from the lock screen instead of extending your arm toward the screen to swipe up – a welcome enhancement for those who work with their iPad Pro constantly connected to a keyboard. There's plenty to appreciate about Apple's Smart Keyboard – an accessory designed on the premise of integration between hardware and software, following the same core principles at the foundation of AirPods, Apple Pencil, and (even though some liked to make fun of their peculiar design) Smart Battery Cases. 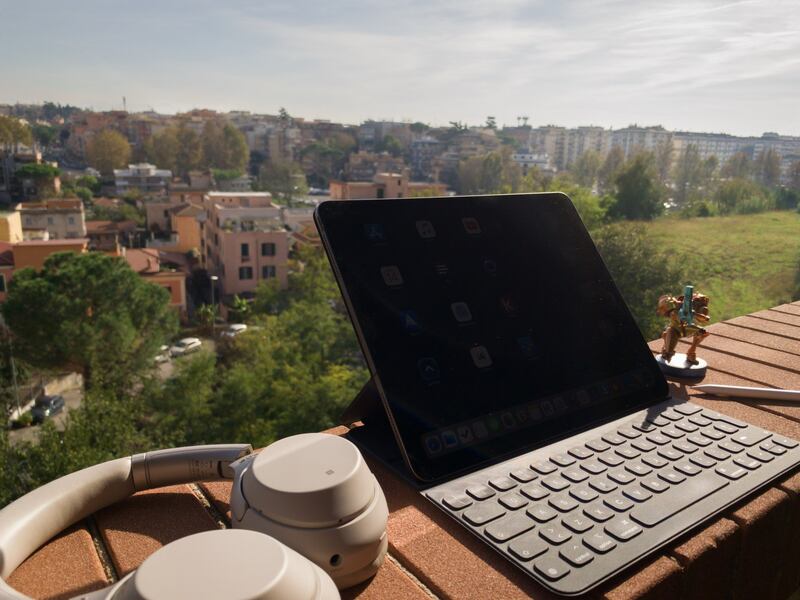 But since its debut in 2015, I've been saving a series of small complaints and bigger annoyances with the Smart Keyboard that I'd like to revisit now that Apple has shipped its evolution for the new iPad Pro – the Smart Keyboard Folio. Two days ago, I walked into my local Apple Store and bought the new 12.9" iPad Pro along with a Smart Keyboard Folio, second-generation Apple Pencil, and LG's UltraFine 4K display (plus, of course, AppleCare+ because these iPads don't come cheap). As I shared on Twitter and the Connected podcast on Wednesday, I went for a 1 TB configuration (with cellular) in Space Gray, and the display is the monitor I'll primarily use with a new Mac mini I also plan on buying very soon. It's been a busy couple of weeks in our apartment: we've been doing some renovations and buying new furniture, including a larger desk for my "office" (read: a section of our bedroom). As I've shared on my various podcasts for the past few months, getting a bigger desk with a Mac mini and 4K display that would support both macOS and iOS was always part of the plan. While in previous years I was able to offer reviews for the new iPad Pros before launch day, that wasn't possible this year. For this reason, I decided I didn't want to wait several weeks to prepare an in-depth review of the new iPad Pro and avoid questions from MacStories readers until the story was finished. So in a break with tradition, I'm trying something different this time: as part of my semi-regular iPad Diaries column here on MacStories, I'm going to share a collection of shorter and more topical articles about the new iPad Pro over the next few weeks. I believe this generation of iPad Pros is one the most exciting changes to the iPad line in years, and I want to jump straight into the discussion by detailing, step by step, my ongoing experience with the new iPad Pro from the perspective of someone who's been using an iPad as his main computer for the past five years. 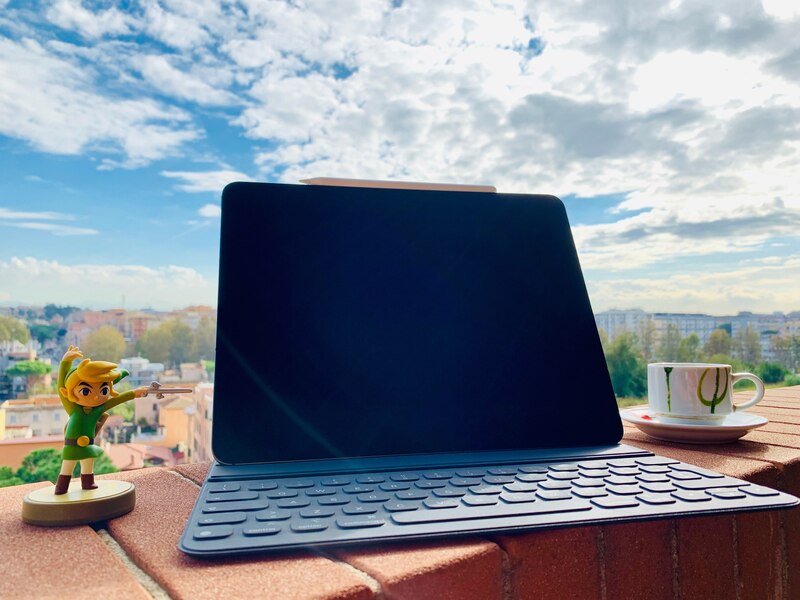 I plan to write about iOS, apps, and my iPad Pro workflow soon, but today I'd like to start by explaining my purchase decision and sharing some initial impressions about the iPad's hardware. Let's dive in. A couple of weeks ago, I shared a series of pictures on Twitter showing how I had been using iOS 11's Type to Siri feature on my iPad Pro, which is always connected to an external keyboard when I'm working. I did not expect that offhanded tweet – and its "smart command line" description – to be so interesting for readers who replied or emailed me with a variety of questions about Type to Siri. Thus, as is customary for tweets that end up generating more questions than retweets, it's time to elaborate with a blog post. 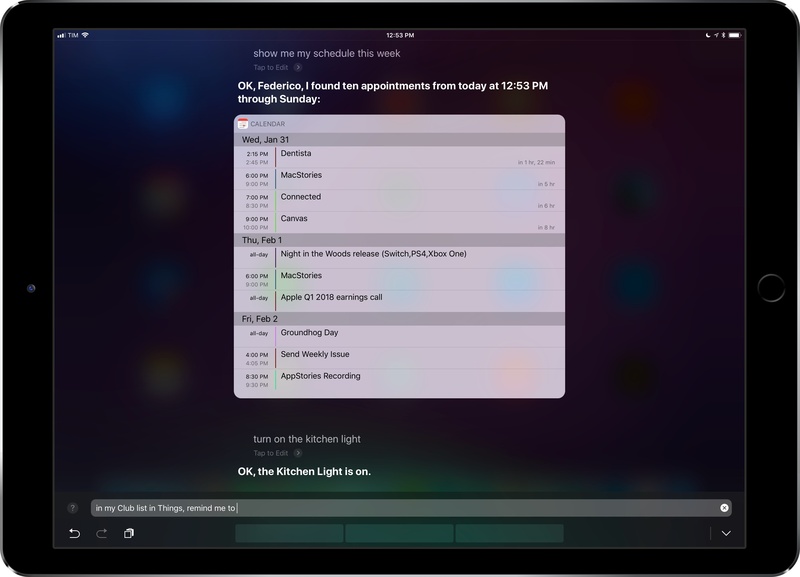 In this week's iPad Diaries column, I'll be taking a closer look at Type to Siri, my keyboard setup, and the commands I frequently use for Siri on my iPad; I will also detail some features that didn't work as expected along with wishes for future updates to Siri. 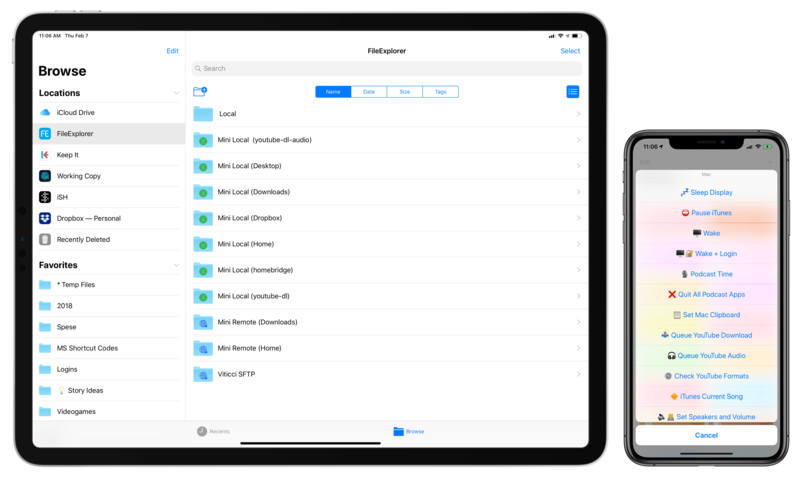 In my review of iOS 11, I noted that the impact of drag and drop – arguably, the most powerful addition to the iPad – would be best measured in the following weeks, after developers had the time to update their apps with richer implementations of the framework. 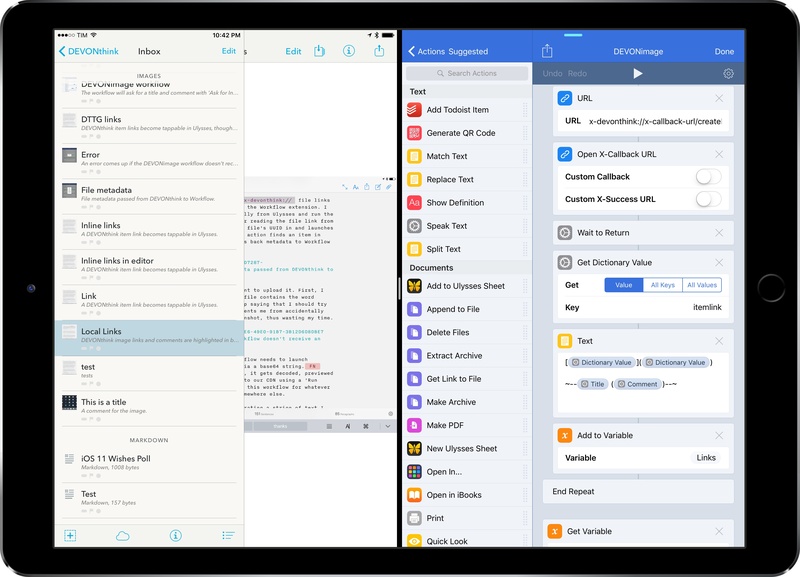 I dedicated a large portion of my review to drag and drop as I felt the feature would fundamentally reshape our interactions with iPad apps and the entire OS altogether. However, I knew that wouldn’t happen right away. 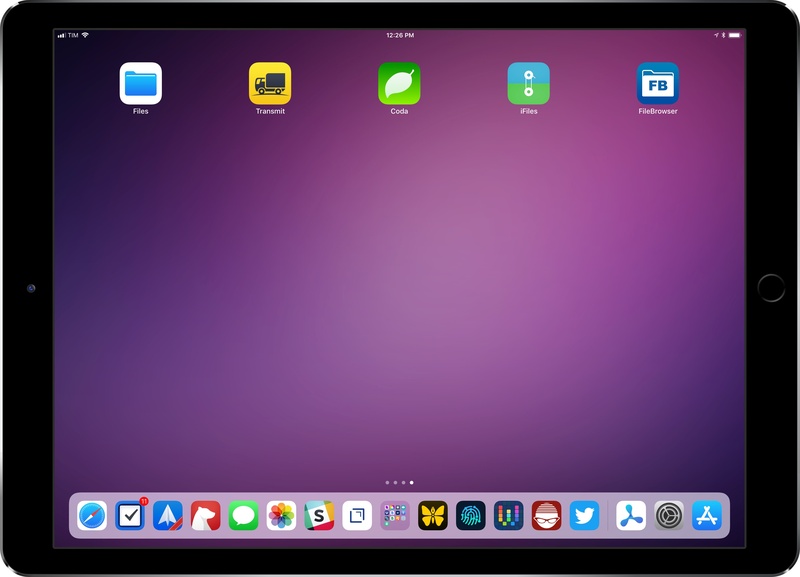 With iOS 11 having been available for nearly two months now, I think it’s time to reassess the effect of drag and drop on the iPad’s app ecosystem. Starting this week, I’m going to take a look at some of the most important tasks I perform on my iPad and how drag and drop is helping me rethink them for my typical workflow. 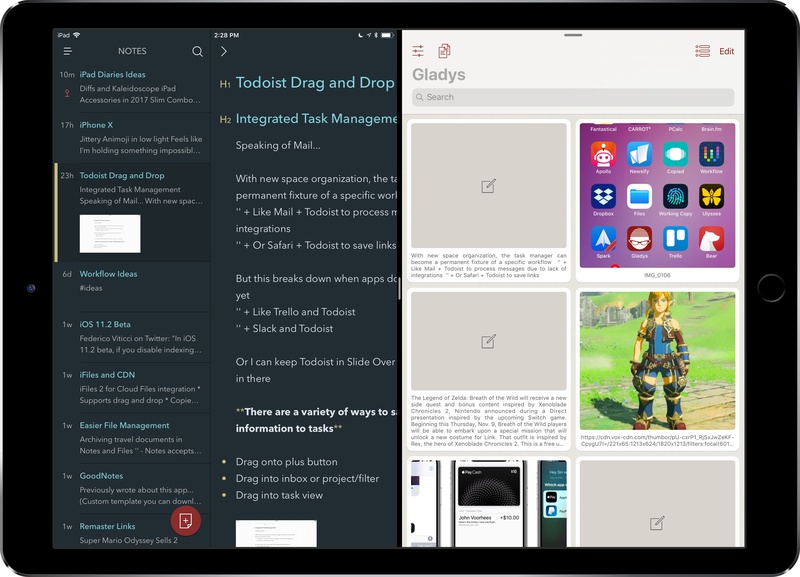 For the comeback of this column, I chose to focus on Bear and Gladys – a note-taking app and a shelf app, respectively – as I've been impressed with their developers' understanding of iOS 11 and intricacies of drag and drop. When I started researching this mini-series, I assumed that drag and drop hadn't dramatically affected my favorite third-party apps yet. I was wrong. Drag and drop has started to trickle down into several areas of my daily iPad usage, often with surprising and powerful results. When I covered DEVONthink To Go in the first iPad Diaries column back in February, I briefly mentioned the app's limited support for URL schemes and automation. I concluded the article noting that DEVONthink's advanced file management features were ideal candidates for my writing workflow – particularly given the app's ability to store different types of documents, reference them with unique links, and search them with Boolean operators. I also expanded upon the idea of using DEVONthink as my only iOS file manager in the latest episode of Mac Power Users. I've been moving more work documents and other research material (web archives and PDFs, mostly) to DEVONthink over the past two months. The turning point occurred a few weeks ago, when DEVONtechnologies began adding advanced x-callback-url automation to DEVONthink's beta channel and were kind enough to let me test and provide feedback for the functionality. I was genuinely excited by the prospect of a scriptable DEVONthink: due to iOS' lack of a deeply integrated Finder, I've always wanted a file manager that could be extended and enhanced through automation and other apps. With an improved set of URL commands and various optimizations for usage in Workflow, DEVONthink To Go can now be that kind of file manager. I made my decision: this is the app I'm going to use to manage the research content for my iOS 11 review this summer. The automation features introduced by DEVONtechnologies in the latest DEVONthink for iOS go deep into the app's structure, covering discrete functionalities such as file creation, search, and data retrieval. These changes will enable a greater number of users to integrate DEVONthink with their favorite iPad apps and workflows. And while the new commands are documented in the app, I thought it'd be useful to provide some concrete examples of how we can take DEVONthink to the next level through automation.